The Turf Club's senior handicapper Noel O'Brien has rated impressive Irish National victor Our Duke just 1lb below this year's Gold Cup winner Sizing John. 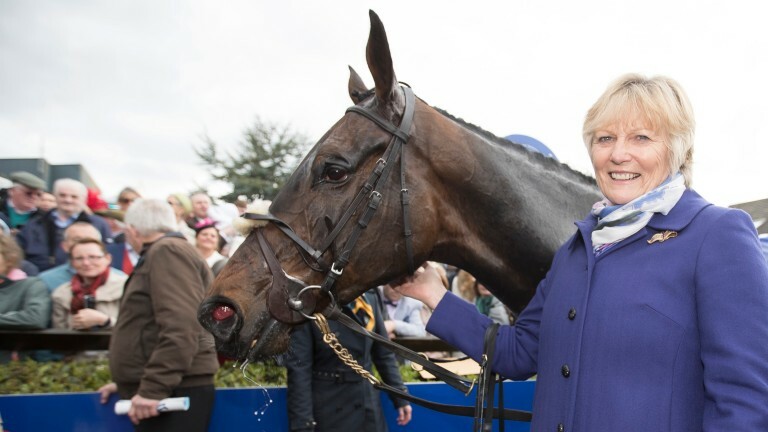 Our Duke has been raised a stone to a new mark of 167 and his trainer Jessica Harrington, who also trains Sizing John, has said his road to the Timico Cheltenham Gold Cup could begin in the JNWine.com Champion Chase at Down Royal as she bids to keep both horses apart for as long as possible next season. With that in mind, she suggested the Down Royal Grade 1 might be the ideal starting point for Our Duke, with the John Durkan Chase at Punchestown possibly a suitable alternative for Sizing John, who is an intended runner at the track in next week's Coral Punchestown Gold Cup. "Our Duke has come out of his race in grand shape," Harrington said on Tuesday. "We'll hopefully keep him and Sizing John apart. I would imagine the race at Down Royal could suit him, and something like the John Durkan might suit Sizing John." Our Duke's 14-length superiority was the widest winning margin in the €500,000 BoyleSports-sponsored contest in recent times, two lengths more than the mighty Desert Orchid won by in 1990. Our Duke's victory under 11st 5lb also meant he lumped the most weight to Irish Grand National glory since Commanche Court carried the same burden in 2000. "I've never seen a horse win a race like that so easily – I couldn't believe it," Harrington admitted. O'Brien was similarly impressed, and reckons this season's best novices are well above average. He said: "We often talk in a theoretical sense about novices' ratings, but Our Duke went and did it. It was an easy decision to put him up a stone. It sounds like a lot and it's a huge rating, but to me it's warranted – it could easily have been 16lb or 17lb. "He's a horse who could be anything. He beat last year's runner-up Bless The Wings and a form horse in Abolitionist off a considerable mark of 153, so you can't knock the form. He was a novice having just his fourth run over fences, and he wasn't just hanging on at the finish – he was going away. "Furthermore, whereas at Leopardstown previously his jumping was novicey, this time he looked like an old hand." Of a crop of novices that includes Altior, Yorkhill, Road To Respect and Might Bite, O'Brien added: "It could be that they are a very special group, from two miles up to three and a half. Altior was able to beat Fox Norton, and Our Duke has annihilated a very decent field of handicappers, so they look extremely good." Harrington also confirmed that her 2014 Champion Hurdle winner Jezki has been roughed off for the summer. He returned after two years off to win at Navan in January but disappointed for a third time in a row at Fairyhouse on Monday. However, his in-form trainer suggested she fully expects the out-of-form nine-year-old to return to the fray next season.